A booklet and audio podcast answering some of the questions children and their families may have about rehabilitation after an orthopaedic operation. Other Investigators: Kylie Aroyan, Karen Bau, Kerr Graham, Abhay Khot, Vikki Leone, Sarah Love, Chanka Nanayakkara, Annette O’Donnell & Adam Scheinberg. 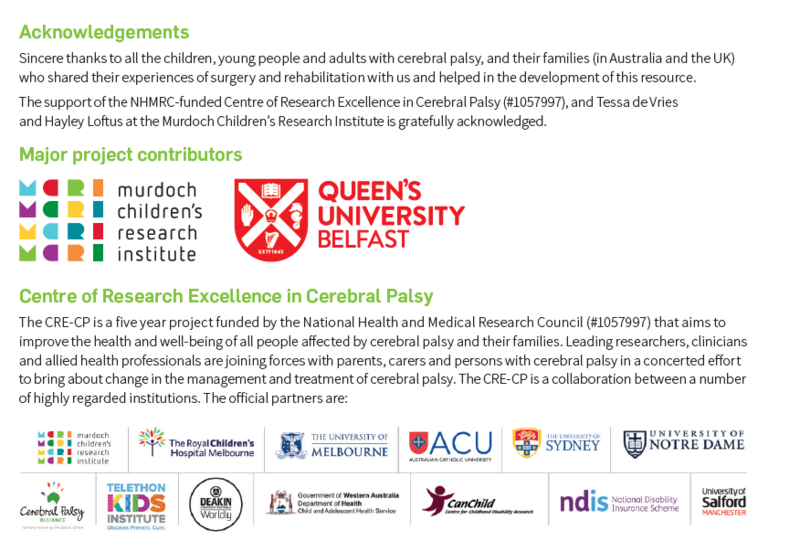 This booklet was created as part of the Knowledge Transfer Fellowship initiative of the Centre of Research Excellence in Cerebral Palsy (CRE-CP). Who is the booklet for? This booklet is for children with CP and their families for whom a decision to undertake lower limb orthopaedic surgery has been confirmed. What is the booklet about? The booklet addresses some of the questions that children and families may have about rehabilitation after their surgery. It covers five key areas: (1) you and your body, (2) getting home, (3) school, (4) recovery and rehabilitation and, (5) what happens when things don’t go to plan? It also has space for families to note the names and contact details of their healthcare teams and support services, and space for notes, questions and information about rehabilitation. Why was the booklet written? People with CP and their families told us that they often feel under-prepared for rehabilitation and recovery following surgery. They felt that highlighting and planning for potential changes in day-to-day activities and therapy after their surgery would result in a better experience of surgery and rehabilitation. What is the aim of the booklet? The booklet aims to help children and families prepare for rehabilitation after surgery. It is intended as a resource to help children and families discuss what happens after they have lower limb orthopaedic surgery and what their needs are likely to be – both within their family, but also with their healthcare teams in the hospital and community. When should it be provided? The booklet should be provided after a decision to operate has been made, and the goals of surgery discussed with the family. Who should provide the booklet? The booklet can be provided by any member of the child’s healthcare team. A pdf copy of the booklet is available on the CRE-CP website (http://www.crecp.org.au/resources/cp/). We anticipate that the majority of families will receive the booklet from their hospital surgical/therapy team. Who should keep the booklet? The booklet should be retained by families. How might the booklet be used? Families may find it useful to take the booklet with them to hospital and therapy appointments to help remind them of specific questions that they might wish to discuss with their child’s team. Families may also find it useful to note information specific to their child in the booklet for reflection and discussion within the family outside of hospital and therapy appointments.